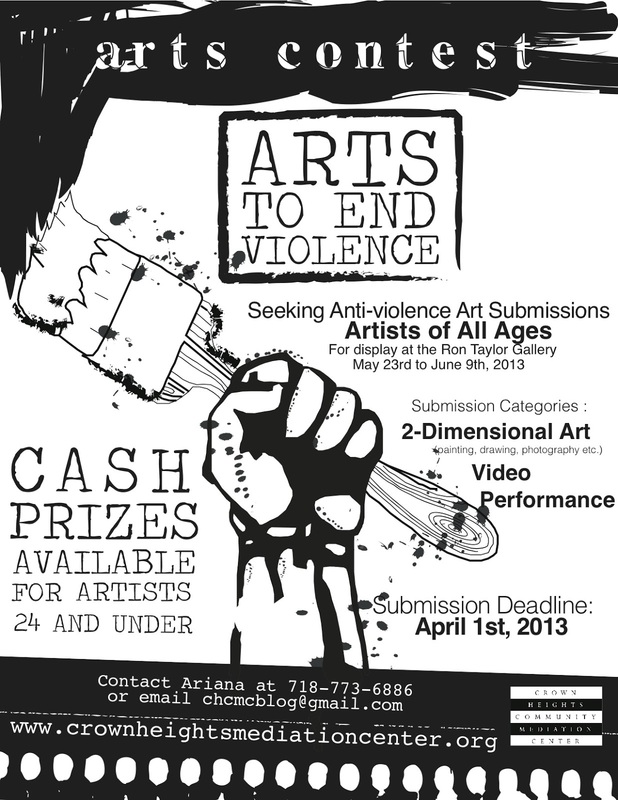 The Crown Heights Community Mediation Center is pleased to announce its third annual Arts to End Violence festival and contest. CHCMC is a neighborhood problem-solving center that aims to strengthen the Crown Heights neighborhood through youth programming, neighbor services, and the community-based anti-gun violence program, Save Our Streets (S.O.S.) Crown Heights. Last year the show brought artists together to share their own messages of peace and feelings about violence. The results were a diverse group of powerful images and performances that invigorated the community efforts to reduce violence. We are again calling on artists of all ages to submit art for this project in three categories: 2-dimensional art, video, and performance. Artists 24 and under are eligible for cash prizes and all are eligible to be displayed in the Ron Taylor Gallery in Crown Heights this spring. The deadline for submission is April 1st. 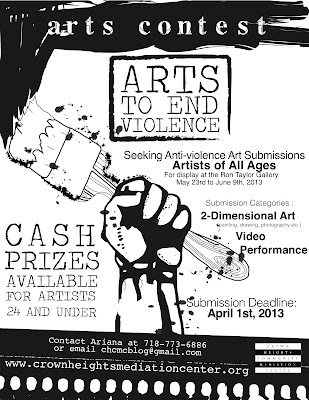 For more details about Arts to End Violence, please see the ATEV page of our blog or check out ourTumblr. The gallery show will open with an evening celebration on May 23rd and art will remain on display until June 9th. We encourage artists, gallery spaces, teachers, art programs and media to call us at 718-773-6886 or email us at chcmcblog@gmail.com to learn more about how to get involved. Please share this information with your networks! See the attached flyer or forward this email. CHCMC staff are happy to present in schools and other locations. Our goal is to open this opportunity to as many people as possible. 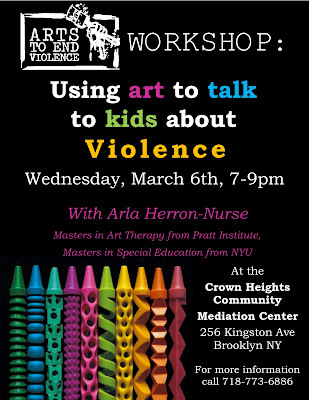 This year's ATEV program will kick off with an Art Therapy for Kids workshop, taught by professional Art Therapist and Crown Heights resident, Arla Herron-Nurse. 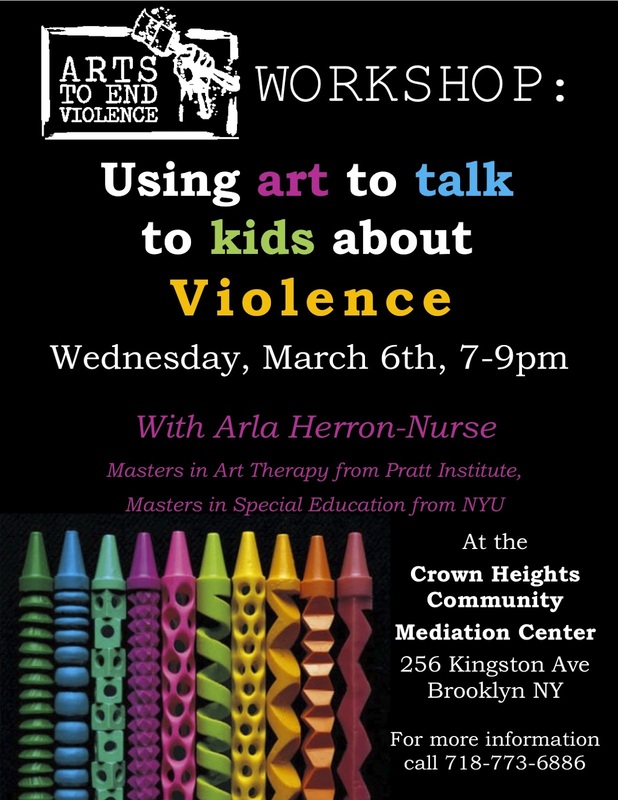 The event will be on Wednesday, March 6th, from 7-9pm at the Crown heights Mediation Center (256 Kingston Avenue, between Lincoln and St. John's Place). The event is free, materials are provided, and all are welcome. Please RSVP to Ariana Siegel by calling 718-773-6886. Please see the attached flyer to share with your networks.